In an attempt to put up as many peaches as possible and enjoy them through the winter, I’ve started dehydrating a large portion of what I’ve been getting from the farmer’s market. Using my new Nesco dehydrator, I”ve finished one batch already, and have a large bag from this past weeks market that will need to be done tomorrow. 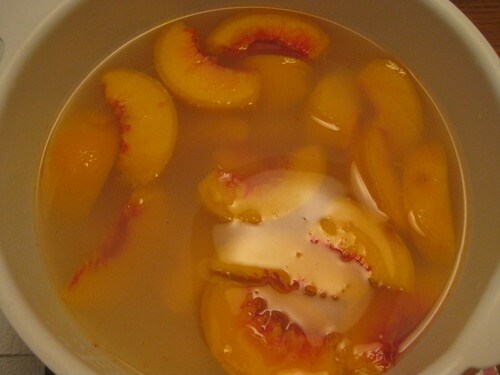 To prepare the peaches for dehydrating, I first blanch them for 1 minute to facilitate removal of the skin. 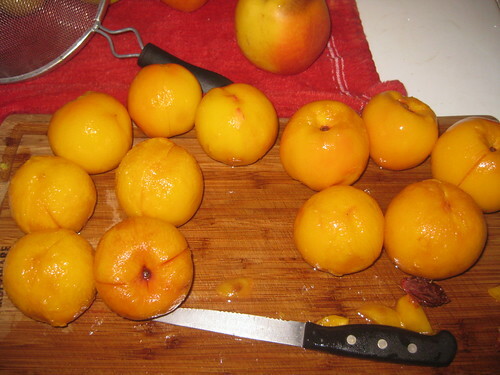 Then I cut in half, remove the stone, and then quarters or eighths depending on the size of the peach. Immediately after slicing, I move them into a bowl of 50:50 lemon juice:water mix. I let them sit at least 5 minutes, until I am ready to place on my trays. I move the pre-treated slices onto paper towels with a slotted spoon to drain the excess for a minute before moving to my trays, and then once all were ready to go in, I set my temperature at 135F. 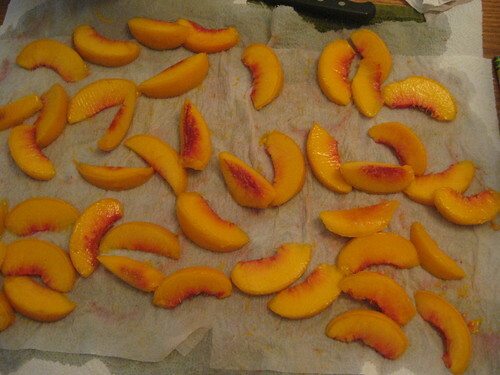 Peaches need between 6-20 hours. I checked mine a couple of times, and think they were in approximately 16-18 hours. I then vacuum sealed the final product. I’ll open this first batch up this week to rehydrate a few to see how they turn out for baking with. But the dried fruit is certainly yummy too. After blanching to remove the skin. Pretreating the slices in lemon juice solution, to prevent oxidation and browning. Draining excess lemon juice before loading up the trays. Trays loaded and ready to go. The final product in the bag before vacuum sealing. Previous Post Spaghetti squash yum! Thanks for sharing!!! They look great! Let me know how they turn out for baking. Is a dehydrator expensive? I know its worth the money with all you can do with it. You may have to be my teacher! Keep posting Girl!! The one I bought is a Nesco fr 75pr 700-watt food dehydrator, amd it was around $50. I’ve seen them run as high as a couple hundred dollars. For my kitchen needs, and based on a friend’s recommendation, I thought this would do the job. It comes with 5 trays and two roll up inserts, and is expandable, so i think its a good investment! At our church we are constantly talking about the importance of food storage and how we need to be prepared. I have been searching for someone that talks about cooking and using dehydrated vegetables. I really didn’t think it would be that hard to find but you would be suprised. Thanks for the great advise and tips! 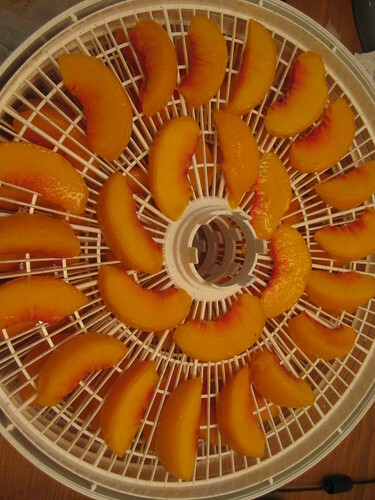 Dehydrating food is great – I can’t wait for spring to really put my dehydrater to work! you can dehydrate just about any fruit or veggy , it just takes a bit of experimenting to find what results you like best to suit your family. 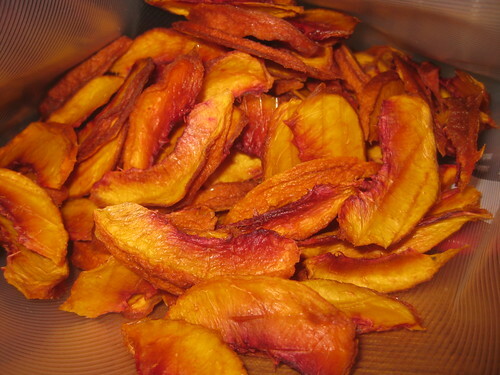 These dried peaches look wonderful! I make these a lot with our handy and reliable food dehydrator and kids in our house can’t have enough. We love dehydrated fruit for snacks too. So far, I think strawberries are the kids’ favorites.